TACLOBAN CITY – Governor Carlos Jericho Petilla congratulated the whole Leyte populace for winning for itself three recognitions this week both from the government and the private sector. In his latest barangay visitation conducted in the barangays of Palo, his hometown, Gov. Petilla shared to his constituents of the three recognition that Leyte has earned and set to receive this month while expressing his gratitude for their continued support to his governance. “We will not be earning these awards, these accolades if not for the support of everybody. Above everything else, these awards tell us that anything can be achieved by working together,” Gov. Petilla said. The Department of the Interior and Local Government awards the province the Seal of Good Housekeeping and the Pamana ng Lahi while the Philippine Chamber of Commerce and Industry recognized Leyte for the third time now as the Most Business Friendly Province in the whole country. Gov. Petilla likewise expressed his appreciation for the members of the Sangguniang Panlalawigan for giving their full support to the programs of the province and setting the policy directions for the provincial government to advance in its governance and public service. The Seal of Good Housekeeping is a mechanism comprising a set of criteria aimed at recognizing Local government Units (LGUs) with good performance in internal housekeeping particularly in the areas of Planning, Sound Fiscal Management, Transparency and Accountability, and Valuing Performance Management. Meanwhile, the Pamana ng Lahi aims to accord government recognition to provinces, cities and municipalities that have distinguished themselves in the performance of their roles and responsibilities not only on the basis of a single program performance but also on their significant and quantifiable achievements along major development initiatives in local governance (administrative, social, environmental and economic governance). Gov. Petilla likewise expressed his appreciation to the Philippine Chamber of Commerce and Industry for recognizing Leyte’s business efforts and imposing acceptable policies and programs for existing and potential investors and businessmen, both local and foreign. He added this is one special recognition as it will be received by the province for the third time while he thanked the business community in the province for helping the province create a favorable environment in jumpstarting or expanding business ventures. MAASIN CITY, Southern Leyte – The city local government unit is willing to partake of a reclaimed lot within city to be used as the site for a new city jail. This was learned from Eleuterio Ortiz, Provincial Head and concurrent City Warden of the Bureau of Jail Management and Penology (BJMP). At the weekly “Media Forum” Wednesday where he was the guest live at dyDM, Ortiz quoted City Mayor Maloney Samaco as saying the new prison facility can be located at the reclamation area in barangay Combado, this city. The new structure will be a two-storey building, but details on specific area or how much would be the cost-sharing between the BJMP and the city government for the project are still unknown as of the moment. How soon such a project can start in its construction stage was also another unknown factor, even as Ortiz hoped it can be realized sooner than later. Ortiz earlier disclosed a resolution passed by the city council that called for the relocation of the city jail in barangay Bactul, a far-flung, interior barangay more than 15 kilometers from the city proper. He said he lobbied for reconsideration of the planned Bactul site, citing as reason its far location from the authorities which could pose as an invitation for enemies of state to rescue one of their own, if ever. The present city jail at the old municipal building in the heart of the city has been cramped and crowded, with its present population of 58 inmates, including one lady, in a jail capacity of only 30 prisoners, Ortiz said, adding that the edifice itself was already dilapidated and needed major repairs. This building will be re-invented and be transformed into a museum once the jail occupants can be transferred to the new location, Ortiz added. TACLOBAN CITY – The Board of Investments (BOI), together with the Local Government of Ormoc City, and the Department of Trade & Industry (DTI) Leyte Provincial Office, in coordination with the Ormoc City Chamber of Commerce and Industry and other private business organizations in Ormoc will be hosting a BOI Orientation-Seminar on the 2011 Investment Priorities Plan (IPP), and at the same time, the 1st Ormoc City Investment Conference or I-Con. This was bared by DTI-Leyte Provincial Information Officer Suzette R. Pablo, who shared that the Orientation-Seminar and the Investment Conference will be held at the New Ormoc City Hall, Ormoc City on October 17-20, 2011. The discussions during the said orientation-seminar, Ms. Pablo reported, will focus on the proposed 2011 National Investment Priorities Plan in the country, while subjects of discussions during the Investment Conference will center on the latest opportunities specifically in the areas of agri-business, tourism, information and communication technology or ICT, and the latest trends in business service development. During the four-day activity, there will be a tourism, trade, investment and industrial exhibit, a DTI Diskwento Sales Caravan, as well as an Agro-Agri, Aqua Fair. On the other hand, a series of activities has also been lined-up on October 19, and some of these are: the BOI Orientation-Seminar on the 2011 Investment Priorities Plan; BOI On-Site SME Project Registration; Philippine Business Registry MOA signing with Usec Zenaida C. Malaya and Ormoc City Mayor Eric Codilla. On the same day, there will also be an induction of the Ormoc City Local Price Coordinating Council; and the Ormoc City Investment Conference - Business Consultation and Matching on: agri-business, tourism, and information and communication technology. Lastly, Pablo revealed that ten SMEs in Ormoc City will also be given recognition and award, and at the same time the Department of Education will turn-over PCPS 4 computer package to a school in Ormoc. MAASIN CITY, Southern Leyte – The Southern Leyte Provincial Council for the Protection of Children will initiate for the distribution of 300 pairs of rubber slippers to children in the municipality of Sogod to highlight the Children’s Month celebration this year. Lead by Sangguniang Panlalawigan Board Member Daisy Gamale, who is the chairman of the Provincial Council for the Protection of Children, a culmination program on the celebration of the Children’s Month has been set on October 18, 2011, Provincial Social Welfare and Development Office (PSWDO) senior staff Amelita Malazarte, who is also the designated Public Information Officer disclosed to PIA today. Pursuant to Presidential Proclamation No. 267 issued in 1993, the National Council for the Welfare of Children together with the Regional Sub-Committee for the Welfare of Children spearheads the celebration of October as the National Children’s Month in recognition of Filipino children as the most valuable assets of the nation and their vital role in nation-building. Malazarte said on October 18, the provincial council will start with the distribution of 300 pairs of rubber slippers to public school elementary Grade Six pupils in the morning which shall be followed with a motorcade right after the lunch and a short program at Sogod, Southern Leyte. The said activity will also be graced with the presence of Provincial Governor Damian G. Mercado, PSWDO Provincial Head Nelita Gomez, among other provincial key officials and personnel, she said. Meanwhile, Malazarte also reported that other local councils based at the municipalities in the province also initiated their respective activities such as conduct of mass, cheer dance competitions, parade, ground demonstrations, draw and tell, literary contest and mass feeding to day care children. She added that other activities includes the hanging of streamers and radio guesting at local radio stations to further promote awareness of the children’s welfare and needs. Earlier this month, Provincial Governor Damian Mercado led in the MOA signing the Provincial Inter-Agency Committee Against Trafficking (PIACAT) and Violence Against Women and Children (VAWC) for the province of Southern Leyte, Malazarte added. TACLOBAN CITY – The Revenue District Office No. 86 of Borongan in Eastern Samar topped this year in terms of collection performance for the period January to August among the six revenue district offices under Revenue Region No. 14 of the Bureau of Internal Revenue (BIR) in Eastern Visayas. RDO 86-Borongan was able to collect P209.165M as against its collection goal of P187.732M for the 8-month collection period that placed the revenue office at rank number 1. It posted an excess of P21.433M or 11.42% of its tax collection as against tax collection goal. RDO 86-Borongan was the only revenue district office among the six revenue district offices in the region that posted a positive result based on collection performance by RDOs for the 8-month period. The revenue district office of Borongan was also ranked number 1 in terms of collection performance among the six RDOs in 2010 after the revenue district posted P153.382M. Atty. Diosdado R. Mendoza, new regional director and Atty. Nasser A. Tanggor, assistant regional director, Revenue Region No. 14 of BIR-8 personally handed the certificate of recognition to Josephine B. Catamco, assistant revenue district officer of RDO 86-Borongan representing RDO Eddie A. Castillo being the top collection performer in the 1st semester of 2011. RDO 87-Ormoc was rank number 2 in terms of tax collection performance as against tax collection goal by RDO from January to August 2011 in the amount of P483.252M versus goal for the same period at P 510.911M. Came in rank number 3 was RDO 85-Catarman with a tax collection of P191.792M versus tax collection goal of P214.717M followed by RDO 90-Maasin City - P219.403M versus tax collection goal of P247.170M; RDO 87-Catbalogan, Samar - P318.905M versus tax collection goal of P375.396M; RDO 88-Tacloban City - P1,106.651B versus tax collection goal of P1, 347.366B. RDO 88-Tacloban City posted the highest tax collection shortfall for January to August 2011 at P240.715M which represents -17.87% followed by RDO 87-Catbalogan at P56.491M or -15.05%; RDO 90-Maasin City at P27.767M or -11.23%; RDO 89-Ormoc City at P27.659 or -5.41% and RDO 85-Catarman, Northern Samar at P22.925M or -10.68%. Meanwhile, BIR-8 attributed to the shortfall in tax collections for the 8-month period this year in the decrease of remittances on creditable expanded withholding tax by the DPWH, LGUs and other government agencies; higher growth rate allocated to income tax goal pegged at P4.3 B for 2011 and the decrease in Tax Remittance Advices (TRAs) of national government agencies, local government units which are dependent upon government money payments on infrastructure projects and programs in the region for the year. 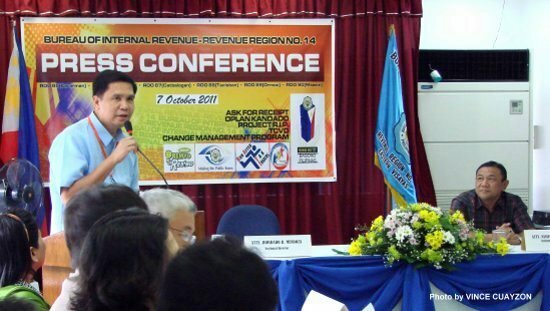 TACLOBAN CITY, Leyte – The new chief of the regional office of the Bureau of Internal Revenue (BIR) expressed his optimism that the shortfall in tax collection target in Eastern Visayas will be lowered down to just single digit at the end of the year. Atty. Diosdado R. Mendoza who just assumed office as regional director of BIR-8 (Revenue Region No. 14) in September this year, made the promising statement in a press conference with members of local media held at the BIR office on October 7. Based on the collection performance as against collection goal of BIR-8 from January to August this year, BIR-8 posted a tax collection of P2,529,168,000 as against collection goal for the same period at P2,883,292,000. The collection for the period is short of P354,124,000 which translates to a shortfall of -12.28%. However, the collection for the same period in 2010 is much higher as BIR-8 was able to collect P2,581,135,000 or an increase of P51,967,000 or 2.01%. Mendoza revealed that BIR-8 composed of six revenue district offices was able to collect this September 2011 an amount of P322,365,000 which exceeds by P33,697,000 as its goal is only pegged at P294,668,000 or higher by 11.44% of the goal for the month. The September 2011 tax collection of BIR-8 is 16.90% higher than the tax collection for September 2010 as it posted a tax collection of P280,887,000 or a difference of P47,477,000, Mendoza informed. Mendoza remained optimistic of lowering the collection shortfall as against collection goal for the year pegged at P4.3B with the start of several big infrastructure projects later this year which will increase the collection of income tax due to collection of Tax Remittance Advices (TRAs) and creditable expanded withholding tax coming from the Department of Public Works and Highways (DPWH) and local government units here in the region. He mentioned the construction of the provincial convention center of Leyte province which costs P100M, the expansion project of the Leyte Metropolitan Water District (LMWD) which costs P400M and other government infrastructure projects that will be undertaken later this year in the region. It was learned from Arsenia C. Gente, chief, collection division of BIR-8 that BIR-8 has already reached 67% of its collection goal for the year. Meanwhile, Mendoza urged media to help BIR-8 in increasing public awareness and in strengthening the tax information dissemination campaign which he considered as a big help in the tax collection effort of the bureau. MAASIN CITY, Southern Leyte – If only to put the records of school-based pupils and students straight, the National Statistics Office (NSO) here through its provincial head Jimmy Dagupan aims to interface with the mentors for an orientation on civil registration matters. Last year, Dagupan was able to gather all the village secretaries of the province’s 500-strong barangays for a similar objective, the gathering said to be the first of its kind nationwide. As a result, about 98% of civil registry records around the province were now accurate and in order, as the barangay secretaries would see to it that the entries in the birth certificate of newborns in their respective areas should be correct before submission, Dagupan said during the “Action Center” kapihan cable TV program Wednesday. Still, he was concerned about the remaining 2%, probably caused by honest mistakes, and he planned to link with the local offices of the Department of Education (DepEd) in the city and province to address this gap. “We intend to coordinate with the Department of Education for the teachers around the province to be given time for an orientation on civil registration,” said Dagupan. He said birth certificates of children must be asked upon enrollment by virtue of a law that was in effect since the mid-1970’s, but until the present, the common lament on erroneous names since elementary, high school, and college years of a certain person are still familiar. Dagupan dug into history to explain why changes in spelling and even full names and surnames of people can happen, saying that civil registration in the country came into force only in 1944 – ironically the war years – and over time, this process underwent transition in the system. Worse, baptismal records for those without civil records often were arbitrarily written by Church-based scribes, or simply listed out of negligence, without care for particular spellings, and thus taken for granted. All these can be corrected once educators take pains checking on records at school for consistency, the expected output of the planned civil registration orientation for teachers, Dagupan mused. For those already saddled with problems on spelling and other minor or major details in their birth documents, Dagupan said Republic Act 9048 can help them lessen their costs to effect such changes, advising those concerned to see him or the Local Civil Registrars in their localities. NAVAL, Biliran – Some 26 bags of fresh blood were donated by the Philippine National Police (PNP), Biliran Provincial Office led by Police Senior Superintendent Alfredo Sabornido during the blood letting on Thursday, October 6 which was conducted right at the provincial camp in Brgy. Larrazabal, Naval, Biliran. This was revealed by Police Officer I Venus Abrigo of the PNP Biliran Police Community Relations in an interview with the Philippine Information Agency (PIA), Biliran Provincial Office. She said, actually, there were more than 30 volunteer blood donors from the PNP provincial command including the 4th year Criminology students of the Naval State University (NSU) assigned in the unit as on-the-job trainees who submitted for screening before the actual extraction of blood, however, only 26 of them were found fit and qualified to donate blood. Of the 26 volunteer blood donors, 16 were PNP men and 10 were criminology students. The volunteer blood donors were examined by Dr. Fernando Montejo, Municipal Health Officer (MHO) of Naval, Biliran to ensure they were fit to donate blood. The blood donors were also made to answer a three-page questionnaire to evaluate their qualifications to donate blood to be added to the stock of fresh blood of the Biliran Provincial Hospital blood bank. The series of blood letting scheduled by the Rural Health Unit (RHU) of Naval has resumed starting October 6, after it was temporarily stopped due to the preparations of the Naval fiesta in October 1, 2011. In yesterday’s blood letting which is a half-day affair only, PIA-Biliran, being one of the coordinating agencies to the activity could not join the group because the schedule was in conflict with the regular Kaiphan sa PIA forum which is held every Thursday. The blood letting conducted by RHU-Naval is in line with the National Voluntary Blood Donation Program of the government carrying the theme “Dugo Mo, Buhay Ko”. MAASIN CITY, Southern Leyte – As the local chief executives (LCEs) throughout the nation will celebrate the 20 years of local autonomy next week, Barangay Hingatunggan of Silago vies for the national level Lupong Tagapamayapa Incentive Award (LTIA) to be given during this year’s celebration. The celebration is spearheaded by the DILG and the Union of Local Authorities of the Philippines wherein all the local chief executives in Southern Leyte are set to attend to the national convergence in Manila on October 9-11, DILG Southern Leyte LGOO IV Loren Abrau, who is also the designated Public Information Officer disclosed to PIA Southern Leyte. Abrau said Barangay Hingatunggan is an intermittent regional awardee and has been a national awardee last 2001 for the LTIA. This year, Barangay Hingatunggan is vying for the LTIA national award being nominated now among the top three barangays nationwide, Abrau added. The attendance of the members of the League of Provinces of the Philippines, League of the Municipalities of the Philippines and the League of the Cities of the Philippines were represented by the (18) municipalities, (1) city local chief executives to be led by Provincial Governor Damian G. Mercado, Abrau further said. She added that during the said occasion three different local government awards namely Seal of Good Housekeeping, EXCELL Awards, and Lupong Tagapamayapa Incentives awards will be given to deserving LGUs in recognition of good performance. Meanwhile, on October 9, the DILG issued memorandum circular for a synchronized barangay assembly in the province in time with the celebration of the 20th local autonomy anniversary wherein all barangay officials, staff and workers will conduct a synchronized text voting of the Puerto Princesa Underground River (PPUR), Abrau added. TACLOBAN CITY – The Pantawid Pamilyang Pilipino Program, otherwise known as 4Ps, is a poverty reduction measure of the Philippine government that focuses on the human capital investment in the poorest of the poor household in the country. Said program is a flagship poverty alleviation project of the Department of Social Welfare and Development (DSWD), and it embodies its vision, mission and mandate. During the “Harampang ha PIA” which was conducted on October 6, 2011 DSWD Regional Office VIII shared that currently, 4Ps is already being implemented by the by their Office regionwide and said Office welcomes reactions or complaints, through text, relative to its implementation. In order to send comments, reactions or complaints, one may text 4Ps<space>name<slash>place<slash>complain and send to 0918-912-2813. It was bared that as of July 2011, the recipients of DSWD’s 4Ps are as follows: Leyte - 28,528 households; Tacloban City - 5,230; Southern Leyte - 2,178; Biliran - 3,298; Western Samar - 54,627; Northern Samar - 36,675; and Eastern Samar - 5,532. The program, according to DSWD, provides cash assistance to the underprivileged to alleviate their immediate needs, and to break the intergenerational cycle through investments in human capital. For a family to be able to enjoy the benefits of the program, DSWD informed that said family must be a resident in the municipalities and barangays selected for the Pantawid Pamilya program; and those whose economic conditions are equal to or below the provincial poverty threshold. Likewise, the couple should have children aged 0-14 years old or have a pregnant woman at the time of registration into the program; and are willing and able to commit to the conditions specified by the program. DSWD added that the Pantawid Pamilya, which has also set some conditions, is currently being implemented in coordination with the Department of Health, Department of Education, National Poverty Commission, Department of Interior and Local Government, National Nutrition Council, Department of Agriculture, and Land Bank.